Above: Interface options on the rear of the screen for DVI-D and D-sub. Audio power is for optional sound-bar attachment. It's nice to at least see Samsung haven't scrimped on interface options here, with a DVI-D input being present - HDCP certified in fact. The dynamic contrast ratio of 3000:1 is impressive (on paper at least), and again, is something Samsung could have left off if they wanted to make this a budget model. Thankfully, they haven't done this, and that means along with a nice range of ergonomic adjustments, the SM245B isn't just your average budget screen. Above: Side and rear side views of the screen, click for larger versions. The bezel and stand on the SM245B is of a matt black finish, with a slight glossy trim to the base of the stand. The panel itself features standard anti-reflective (AR) coating, as opposed to any glossy finish. From a side view, the screen is fairly chunky and squared, but at least feels quite sturdy. The materials all feel of decent quality, and the monitor on the whole feels well built. The OSD operational buttons are discreet and easy to operate, and the OSD itself is simple to navigate and in keeping with other Samsung models in their current range. There are quick access options from the buttons to the MagicBright preset modes, brightness, input (DVI and VGA) and auto image adjust (VGA mode only). The power button glows a subtle blue colour when in operation but did feel a little flimsy perhaps. The stand offers a decent height adjustment, giving a range of about 100mm (10cm). I doubt you'd ever need to adjust it to its full height, but at least that range is there. The fluidity of the adjustment is also very good and easy to manoeuvre. The tilt and swivel adjustments are also easy to work, with a decent range to set the screen just how you like. Oddly, the screen can be rotated ever so slightly to the left and right, it almost feels as if the screen should have a rotate feature to allow you to switch between portrait and landscape mode. Alas, this feature isn't available, and at least it is easy enough to set the screen at a horizontal level. It just seemed a little strange to be able to move the screen a little in this way. The screen is also missing any additional connectivity options as compared with some of the other 24" models, and sometimes USB ports, component connections and card readers can be useful. Obviously Samsung needed to make sure they kept the price of this model down, so these features are not on this model. The Samsung SM245B utilises a 6-bit TN Film panel with Frame Rate Control technology, capable of producing a reported 16.7 million colour palette. The panel forms part of Samsung's latest "Best TN" III generation of panels. The standard backlighting used only really matches the sRGB colour space, at 72% of the NTSC gamut. An important thing to consider for most users is how a screen will perform out of the box and with some basic manual adjustments. Since most users won't have access to hardware colorimeter tools, it is important to understand how the screen is going to perform in terms of colour accuracy for the average user. I restored my graphics card to default settings and set it to its standard profile. The SM245B was tested at default factory settings out of the box using the LaCie Blue Eye Pro and their accompanying software suite. Default settings of the screen were 100 brightness, 75 contrast. MagicColor was 'off', Colour Tone was 'normal', Colour control showed RGB settings were at 50 each and gamma was in 'mode 1'. The MagicBright preset mode was also in 'custom'. Out of the box, the Samsung SM245B suffered from the normal problem of being set at far too high a brightness. With the setting at 100 in the OSD, the image was far too intense to work with, and this should be the first thing you turn down when you receive the screen. Colours felt vivid on the most part, perhaps a little too so, and the overly bright settings caused some of the shades to appear washed out. Blue shades didn't feel right most notably. The measurements with the colorimeter supported this subjective analysis. Luminance reached a high 364 cd/m2, just shy of the specified 400 cd/m2 maximum brightness of the screen. At this level, black depth reached a pretty poor 0.50 cd/m2 only, and the contrast ratio was 728:1. 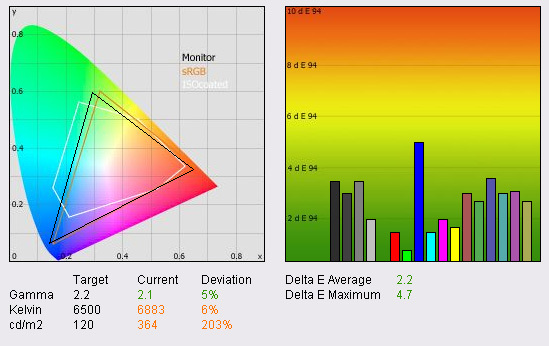 The CIE diagram on the left shows a triangle representing the SM245B monitor, and this covered pretty much only the sRGB colour space as expected. This was a testament to the fact the screen only uses standard CCFL backlighting. Gamma was a little off the desired 2.2 we aim for in our tests, being the default for computer monitors, and the standard for the Windows operating system and the Internet-standard sRGB colour space. However, with a recording of 2.1, it was only 5% out. Colour temperature was also close to the desired 6500k (daylight colour temperature), being recorded at 6883k (6% deviation). The SM245B produced an average dE of only 2.2, meaning colour fidelity was actually pretty good out of the box. Its value did reach as high as 4.7 though, and this was in the blue shades where we had already observed there was a possible issue with the naked eye. Overall, the panel performed quite admirably, and certainly better than some other models we have tested in this sector. 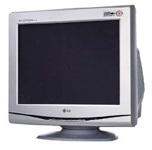 The ViewSonic VX2435WM for instance had a default dE average of 3.8, and reached 9.4 at a maximum. This was also from an S-MVA panel, whereas the Samsung uses TN Film, a technology often considered to be poor in colour rendering capabilities. Even at default settings, the SM245B was pretty good in these test areas, with only the excessive brightness letting the screen down significantly. During the calibration process, the settings for colour levels in the OSD were changed to 58/38/37 (RGB). However, it should be noted that this adjustment only forms part of our calibration process, and the majority of the changes occur at a LUT level, as an automatic process altered by our colorimeter. The red level in the OSD was difficult to adjust to the desired level, and at a setting of 58, left the screen feeling a little pink initially. However, this was corrected later on in the calibration process. Straight away, the obvious change to the screen was that luminance was now a much more comfortable 120 cd/m2 and the brightness setting was now 30 in the OSD. Contrast was still set at a level of 75, but the analysis with the probe showed we had now achieved a calibrated black depth of 0.16 cd/m2. This was a very promising performance from a TN Film panel, a technology which historically has been let down by its weak performance in this regard. This is something we also saw on another Samsung model recently, the 19" SM932B Plus. This offered us a calibrated black depth of 0.14 cd/m2. 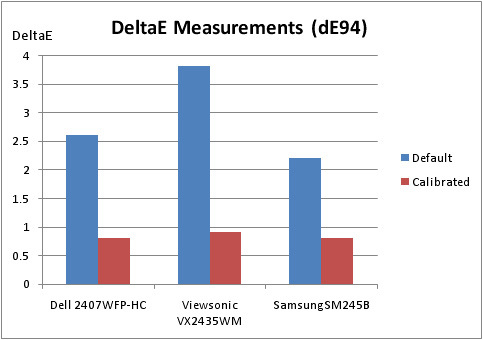 Both Samsung models offered superior performance in this test than some VA based screens we have tested in the 24" sector, including the Viewsonic VXX2435 (0.22) and Dell 2407WFP-HC (0.22). In practice, this impressive black depth gave us a useable contrast ratio of 750:1. DeltaE values were also corrected quite nicely, with an average dE now recorded at only 0.8. LaCie would consider colour fidelity of this screen to be excellent, and with only 1.7 as a maximum dE value, there was only a slight difference between the colour requested and that displayed in the worst cases. Again, a very good performance from a TN Film panel, going to show again that this technology can offer some decent colour accuracy with correct calibration. In the case of the SM245B, you even get some good performance at default settings which is a nice thing to see from a screen which is aimed at cutting costs and lowering the price in this sector. Testing the screen with colour gradients showed no obvious colour banding issues, but some stepping was noticeable, particularly in darker shades. You could detect some slight 'twinkling' from the FRC algorithms, but only if you looked very closely. This is not something which would bother you in practice. By switching to the dynamic contrast ratio option in the MagicBright settings, I was able to measure how bright, and how dark the screen became with the automatic adjustment of the monitors backlighting. The variation was measured from 346 cd/m2 in the brightest white, to 0.21 cd/m2 in the darkest black. You could see the backlight being adjusted on the fly depending on the colour being measured on the screen (white vs. black). This gave a dynamic contrast ratio in practice of 1648:1. To reach a dynamic contrast ratio of 3000:1, and assuming the screens maximum brightness possible is the specified 400 cd/m2, we would need to be able to reach a black depth of 0.13 cd/m2. A tall order for any panel, especially TN Film. Viewing angles were as expected from a TN Film panel. There was an apparent contrast and colour tone shift as you moved away from a central field of view, particularly when moving vertically. The size of the screen actually comes into play a bit here as well, since if you position yourself to view the middle of the screen, you can see some shifting of colours as you glance left, right, up and down. From above, the screen had a blue tint, and from below, a red tint. This was most noticeable when viewing windows with a grey toolbar at the top, since they look a little pink if you're positioned centrally and look upwards. You also have to put up with a red tinting to white word documents in some sections of the screen, but on moving your line of site, you could tell this was a viewing angle issue. Similarly when looking centrally and glancing down to the blue Windows XP toolbar, the contrast shift meant the blues looked a little over-saturated and bright. Horizontally the viewing angles were a bit better, but still characteristically TN Film. I couldn't help feel that perhaps 24" was a little too big for TN Film technology, and there really is no way of getting away from the viewing angle anomalies you can see here. This may not be an issue for some users, but could certainly prove problematic for any colour critical work. This is a shame, since colour accuracy is very good as we showed above, but if you are looking for a more suitable screen for photo editing and the like, I'd suggest looking at VA or IPS panel technologies instead. Panel uniformity was overall pretty good, with only a slight leakage of the backlight detectable along the bottom of the screen. Overall, the screen was pretty good in this area. The 24" screen size and 1920 x 1200 resolution is obviously a welcome feature here, and side by side working is enjoyable for office applications. The text was crisp and clear, with DVI-D offering a slight improvement over the analogue interface, which was still of a decent standard once auto adjusted. The 'text' preset in the MagicBright settings actually lowered the luminance of the screen below even my calibrated 120 cd/m2 custom settings, with brightness being adjusted to 20 in the OSD now. This was actually quite handy, and a more comfortable setting for prolonged office use, especially in darkened conditions. The viewing angles were the only thing which proved a bit of a problem in office use, since you could detect a change in colour tone if you glance up and down from a central view. Not a massive problem by any means, but it did mean that the white backgrounds of word documents appeared with a slight red tint as you looked upwards, and a slight blue tint if you look downwards. Might be a bit off-putting to some users. The Samsung SM245B was tested using the chase test in PixPerAn, a good bit of software for trying to quantify differences in real terms responsiveness between monitors. As a reminder, a series of pictures are taken on the highest shutter speed and compared. The images above show the best case example on the left hand side, and the worst case example on the right hand side. This should only be used as a rough guide to comparative responsiveness but is handy as a way of keeping a constant test of each screen. As you can see from the images above, the performance of the SM245B was average, and a little behind the other 24" models we have tested recently. It should be noted that the Samsung is listed with a 5ms response time, indicating that the screen does not use any RTC technology to boost grey-to-grey transitions. As such, responsiveness is a little behind other models which do use these 'overdrive' methods. There was a noticeable second ghost image behind the moving car in the tests, and it was a little worse than the responsiveness of the Dell 2407WFP-HC. However, for most average gamers, 5ms ISO response times from a TN Film panel are likely to be adequate. It probably won't be long before RTC is more widely used in 24" TN Film models as well. If you compare the SM245B (5ms ISO) with Samsung's 931C display (RTA on = 2ms G2G response time), then you can see that there are improvements with the application of overdrive technology. In gaming and fast moving video scenes, the SM245B showed no really issues with ghosting. Motion blur was detectable if you know what to look for, but generally isn't a problem to the average gamer. One other thing to bear in mind is that you will need a pretty powerful graphics card to run this screen at its full 1920 x 1200 resolution in modern games. The screen does not feature any hardware level aspect ratio control unfortunately, and so if you are playing games at lower resolutions, or in different aspect ratios (4:3 for instance), then the image will be stretched to fill the screen, with the resolution interpolated to fill the 1920 x 1200 pixel area. This is of course unless you have a software method of controlling the aspect ratio, such as NVIDIA's graphics card driver package. The above graph shows the average input lag across several screens tested at TFT Central (top three), and also average input lag as recorded from other sources (bottom four) on some popular and well established 24" models. As you can see, the input lag of the 245B was actually very good, with an average of only 7.5ms, and a maximum of only 10ms. This was a very good performance and better than that of the other 24" models in the above comparison. Users should not be put off by this very low input lag when they are considering whether the screen is suited to gaming. Viewing angles should be wide. The SM245B, being TN Film based, sadly lacked a little in this area. You will spot contrast shifts when changing your vertical alignment to the screen, and so setting a comfortable screen position is tricky. Horizontally the viewing angles are sufficient for a couple of viewers, but the contrast shift vertically proved distracting. Black depth should be good, helping to allow detail in darker scenes to be distinguishable. The SM245B performed very well in this regard, with a recorded black depth of 0.16 cd/m2 beating even the S-PVA equipped Dell 2407WFP-HC (0.22 cd/m2). Movie noise must be kept to a minimum, otherwise artefacts and twinkling in large colour masses can be noticeable. The high resolution of the SM245B means that any compressed or low res / SD content looks a little blocky, and any compression artefacts are accentuated. Noise is noticeable as well, something which is common on TN Film panels. However, if you sit a couple of metres away, which you'll want to with a screen this size, there is no real issue in practice. Consider firstly the fact that the Samsung SM245B is over £100 cheaper than one of the most popular 24" models in the market, the Dell 2407WFP-HC. This is perhaps going to be the main draw of this model for any potential buyers looking for a new screen. A display at this size, and with this high resolution is a bargain at the price. No, it can't quite compete with some other 24" models in terms of specs and features, but it makes a good effort. The presence of HDCP support, a DVI interface and all the useful ergonomic adjustments is pleasing. The performance from the panel, despite being TN Film, is also good in many regards, with it's only obvious weakness being the viewing angles. If you can live with this drawback of TN Film, then the colour rendering and gaming capabilities of this screen are not to be frowned at, and you'd certainly save yourself some money along the way.